I love a lot of things (I have plenty of love to go around), but here are four of my most recent finds that I’m loving right now. I really love the scent of lavender. It’s so calming. So I’m loving that Trader Joe’s is now selling bunches of it for $3.99. It makes the bathroom smell lovely! Plus it looks great beside my wedding invitation, my friend Katie had framed for Brad and I. Speaking of which, our one-year anniversary is Sunday! 🙂 I can’t believe it’s been a whole year! 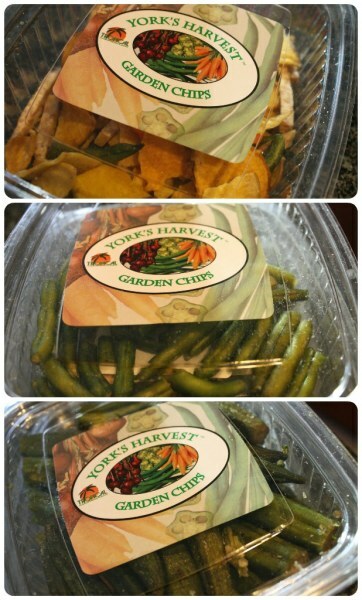 Have you ever tried vegetable or garden chips? I’ve been purchasing them out of the bulk bins of some of the healthier grocery stores for years. Tropical Foods recently sent me some to sample and I had to all but lock them up to keep from eating them over the course of a few days. Putting them on top of the fridge and out of my eye sight helped, but I still love reaching my hand in for a few crunchy bites every now and then. Even those these chips are made with vegetables, they get their crunch from oil, so practicing a bit of restraint is necessary. My favorite are the mixed vegetables (top) which are salty sweet because they contain sweet potatoes among other delicious veggies. I really like the green beans (middle) and okra (bottom) too. Tropical Foods offers different varieties based on what’s season, which I think is pretty cool. Here’s a list of retailers where you can find Garden Chips. Tropical Foods is based out of Charlotte but they sell good all over the Southeast and even the Midwest. This thing has really been an answer to my prayers. A bit melodramatic, but in reality, I’m really glad that I finally broke down and bought one of these. They are a godsend on long run days and almost as important as running shoes when running in the heat I’ve been running through lately. I have had bad luck with sunglasses because I don’t want to spend a lot of money on a nice pair. The cheap ones always get broken or slip off the end of my nose while I run. Plus I love that this visor basically shades my whole face and absorbs a lot of the sweat that usually runs down my forehead. 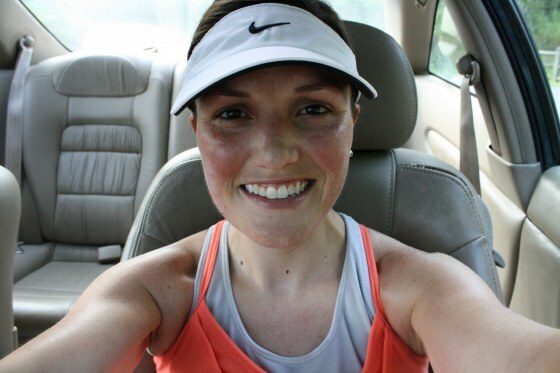 Although, it’s been so hot lately, I’ve had sweat beads accumulate on the brim, then drip on to me, while I run. I know I’ve already swooned over this chocolate bar, but I just couldn’t write a “things I’m lovin’ post” without mentioning it again. For a recap of how much I love this bar, please see the aforementioned post. How did I survive without a TJ’s in my life? I love this bar so much, I want to share it with you guys. But I feel an obligation to share it with someone who doesn’t live within driving distance of a Trader Joe’s. I’ll send a bar to the first person to comment who wants to try it and doesn’t live within 1 1/2 hours of a Trader Joe’s. I live in Florida and the closest TJs is Atlanta or Charleston. 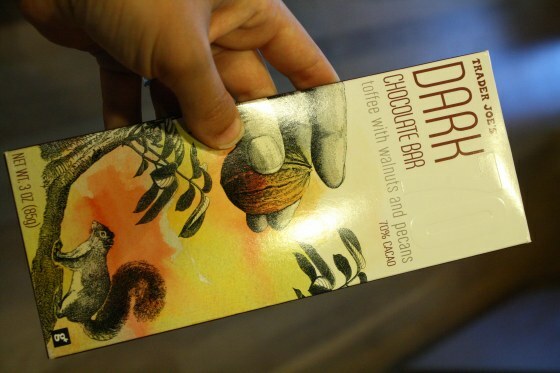 I would love to try any TJ product, especially chocolate! 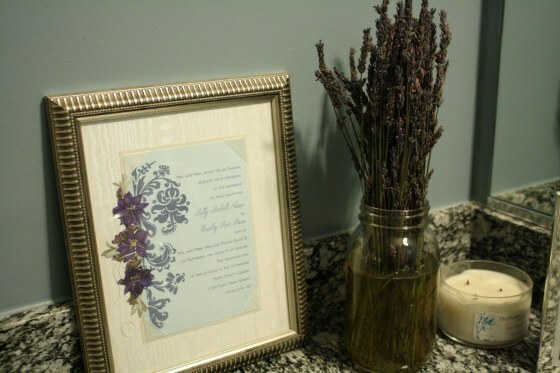 Love the framed wedding invitation. My sister framed mine for a wedding gift for me and I have since had 3 friends’ invites framed. Such a wonderful, meaningful and beautiful piece of art to have at home! I have to confess that I’ve seriously debated driving 6 hours to the closest TJ’s, lol! Whenever I’m somewhere that has one, though, I’m sure to stock up so I’ll have to look for that next time I’m out of town. I live in Utah the closest TJ’s is 363 Miles away in Las Vegas 🙁 I’d love to win! And I adore vegetable crisps!